You are pulled in so many different directions in your day, it’s almost impossible for you to keep up with them. But, this doesn’t mean that you don’t still have your hobbies. You love to crochet, but so many crochet projects take so long to complete, you must move very slowly on them from day to day. This can get frustrating, and you consider giving up. 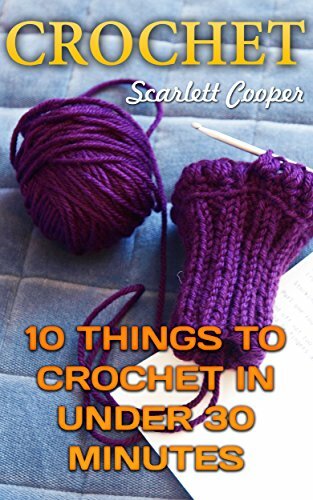 If only there was a way for you to make crochet projects in just a few minutes. If only there were small projects that you could work on in those moments you have to yourself. That’s where this book comes in. In it, you are going to discover a variety of projects you can make in only half an hour or less. These projects are adorable, functional, and perfect for someone who is short on time. That’s where this book comes in. In it, you are going to discover a variety of projects you can make in only half an hour or less. These projects are adorable, functional, and perfect for someone who is short on time.Consider your gift giving problems solved as you make any of these at incredibly short notice. You’re going to fall in love with these little patterns, allowing you to create projects in just minutes.